There is a sailboat club about a ten minute drive from my house. Every time there is a regatta, I want to stop whatever I am doing and just watch them out on the water. On this day, however, I wasn’t near my home. I was visiting an island in the Gulf of Mexico. A sailboat came to the shore. I stopped what I was doing long enough to watch for a while. Never having owned a sailboat, I don’t actually know what it would be like to traverse the ocean with the wind to guide me. Somehow, though, the very sight of one seems to speak to me of peace and a certain freedom. There is a limit to what can be brought on board. The sails themselves are simple and sleek, performing their only task as they move the craft beneath them along the waves. The water is wide with openness and space with endless choice of direction and adventure. When I see a sailboat, am I really yearning to be out on an expedition or am I simply longing for peace? 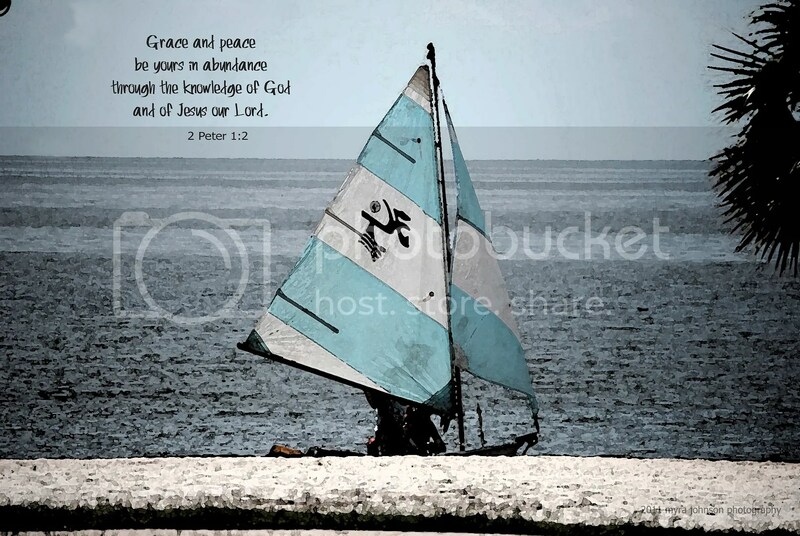 2 Peter 1:2 says, "Grace and peace be yours in abundance through the knowledge of God and of Jesus our Lord." As I was reading several verses from 2 Peter 1 this evening, I began to think about peace in abundance. I thought of two people who have been on my heart for some time now. Asking myself, "Do they have abundant peace in their lives?" I had to say, "no." Well, then, what about me? Do I have abundant peace? The verse states that it is through "the knowledge of God and of Jesus our Lord." Does this mean that the more I know about God and about Jesus, the more peace I will find? Is the reverse true, as well? Does it mean that the less I know of God and of Jesus, the less peace I will experience? I want to know God and Jesus, His Son. I want to be at an uncluttered place in my life where getting to know Him more is unhindered. With wide open spaces and sails ready to respond to His leading, I long to be free. What do you long for today? North face jackets sale for men and women! autySTTY34qin You can rise in the workplace into the membership with all the correct jeans. Very well written . Thank you for sharing, I like this article !